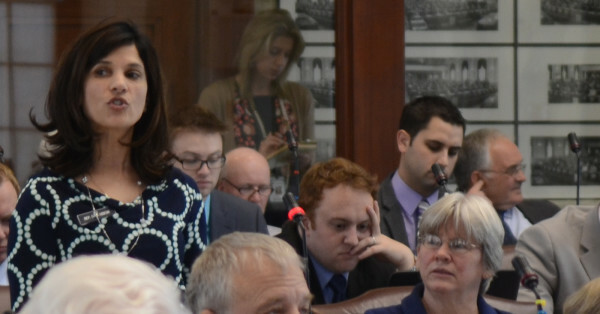 Rep. Sara Gideon, D-Freeport, speaks on April 14 about her bill to expand the availability of Narcan, a drug that can reverse a heroin overdose, during a floor speech in the House of Representatives. 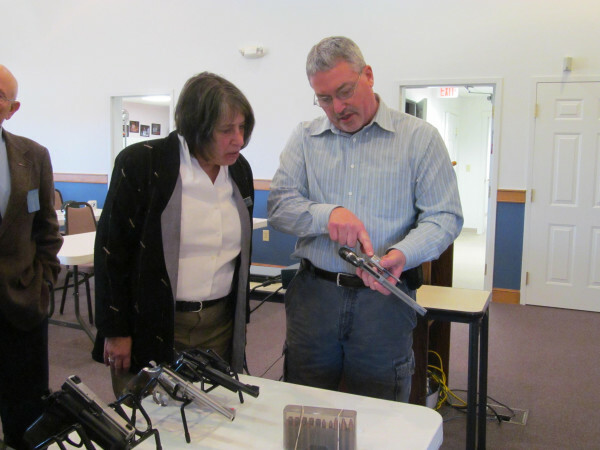 Rep. Janice Cooper, D-Yarmouth, learns about different forms of handguns from firearms expert Sandy Hatt on Thursday, February 7, 2013, at a workshop sponsored by the Sportsman's Alliance of Maine in Augusta. YARMOUTH, Maine — Incumbent Democratic state Rep. Janice Cooper was re-elected Tuesday in House District 47. Rep. Sara Gideon, D-Freeport, also won re-election in House District 48.
Cooper defeated challenger Republican Rick Snow 2,759 to 2,236. District 47 consists of Yarmouth, Chebeague Island, and Long Island. Cooper has lived in Yarmouth 17 years and currently works for Cultural Home Stays, placing foreign exchange students with families in the area. She has served one two-year term in the House. “First of all, I want to say I am delighted I got the majority of votes in all three towns I represent,” Cooper said. Cooper was a staffer for former U.S. Rep. Tom Allen, D-Maine, for nine years. Before that she lived in Washington, D.C., and worked for the U.S. House Judiciary Committee for 10 years as a legislative staffer. She has also worked as an attorney and a journalist. Cooper also volunteers in Yarmouth with Yarmouth Cares About Neighbors and at Firehouse Arts, a community arts education program. Cooper in October said a main issue she is focusing on is trying to expand the Affordable Care Act. She is on the legislative committee in charge of implementing ACA. Cooper said Maine is doing well with the act, but she wants to see more young people sign up for it. Cooper said she also has many environmental concerns that she hopes to address. She is on the Environmental and Natural Resources Committee. She said she wants to work on protecting Maine’s lakes, and proposed legislation that didn’t get through in her first term, but that she will bring back on her second term. Cooper also said she appreciated the clean race. She said she’s looking forward to her second term. Gideon was elected to a second term in House District 48. The incumbent defeated Republican Paul Schulz of Pownal 3,218 to 1,588. Gideon has lived in Freeport 11 years with her husband and three children, all of whom attend Freeport schools. She was a town councilor from 2009 to 2012, served on the board of Freeport Community Services, and was a member of the Freeport Economic Development Corp. Gideon, who has a background in advertising, has also been a volunteer in the Freeport schools. Gideon said she was very thankful to be re-elected. “It has been my privilege to represent the people of Freeport and Pownal in the Maine House and I thank them for their trust and faith as they send me back again,” Gideon said. She said in October three of the issues she’s most concerned about are equal access for education, the cost of health care, and whether jobs are providing enough money. She said the issues she’s most interested in are the ones that affect people every day. Gideon on Wednesday said she’s glad she can continue helping those in her district. “Whether it’s making sure that a person has access to a doctor when they need one, investing in excellent first class educations for our children or making sure that working people are able to provide for their families and put food on the table when they put in an honest day’s work, I will continue to put people and families first,” Gideon said. Schulz said that while he didn’t win, he was happy with the amount of people that voted Tuesday. “I’m deeply humbled by the turnout and the support that we’ve had and I think it’s a tremendous showing of support that so many people came out and exercised their right to vote,” he said. He also hinted at plans of running again in the future. “I certainly wish Sara the best and we’ll come back stronger next time,” Schulz said.